Thomas Lake Harris Thomas Lake Harris (1823–1906) was a preacher, spiritualistic prophet, poet, and vintner. 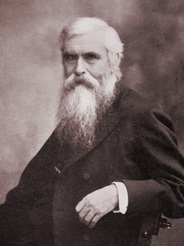 He recognized the unique qualities of the landscape at the north end of Santa Rosa and in 1875 purchased the property to establish Fountaingrove, the first utopian community in California. His Brotherhood of New Life established a dairy and sheep raising operation and later a major vineyard and winery. He was succeeded by Nagasawa Kanaye, (1852–1934) who developed and managed the community's 2,000 acres of vineyards. Harris's community left a significant stamp on the history of Santa Rosa; today that part of town is still called Fountaingrove, home to the Fountaingrove Ranch Master Association (FRMA). A street in the area, Thomas Lake Harris Drive is named for him. The Round Barn, part of the winery Kanaye Nagasawa managed burned to the ground in the 2017 Tubbs Fire. A lake and park in the center of the Fountaingrove neighborhood were named in Nagasawa's honor.